Oregon softball has had quite the decorated season this year. Aside from being ranked second nationally, the Ducks have had yet another member of their team be named the NFCA player of the week. Freshman third baseman, Jenna Lilley has earned this achievement for her second time in her short career with the Ducks. The freshman solidified her case for this award during the Ducks’ series sweep against No. 9 Louisiana this past weekend. Lilley batted .750 in the series, going 6-for-8 while earning a double, six RBIs and a home run in the Ducks’ three games against Louisiana. Jenna Lilley takes a swing at the plate. In game one of the series, Lilley went 3-for-3 on the day with four RBIs and one home run. She followed up her success in the Ducks’ double header by going 3-for-5 while earning two RBIs for Oregon softball. The third baseman from Ohio has had a great start to her career with the Ducks. So far this season, Lilley is leading the team with a .442 batting average going 57-for-129 in all of her at-bats. She also has earned 39 RBIs for the Ducks, arguably making her one of the top clutch hitters in Oregon’s lineup. 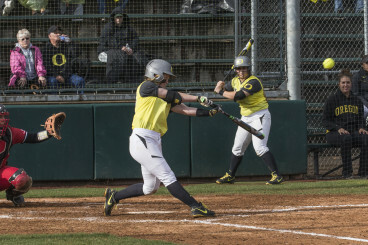 Her clutch hitting will become very valuable for the Ducks as they approach the NCAA Regionals in their pursuit to reach yet another NCAA Softball World Series. 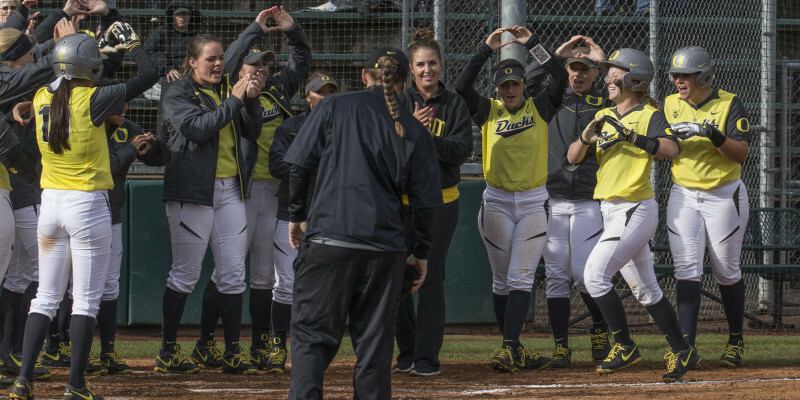 Before the Regionals however, the Ducks will lean on Lilley’s success as they look to wrap up their season by winning their upcoming series against the California Bears and the Arizona Wildcats.